One of the most interesting features of Office 2010 to is the new animated splash screen with the cancel loading button â€“ a first Iâ€™ve seen for almost any application I remember. This is extremely useful for those times when you accidentally launch an application and need to close it instantly without having to wait it to load first. I must say it was difficult to get a screenshot of the splash screen on my PC as it only appeared for about half a second every time I opened an Office 2010 Application. I really like the quick load times and this is just the Beta right now. Things would only be getting better as we get close to final product launch slated for the second half of 2010. I would be writing more short posts on some of the new and interesting features of Office 2010 so make sure you subscribe. 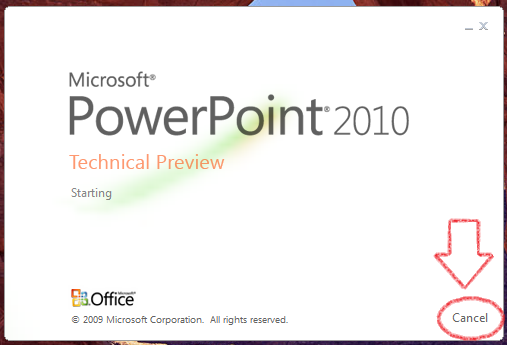 Oh and if you need the Office 2010 Beta, Download it here. Ran 15 queries in 0.188 seconds.